The Site Admin found some free time (finally!) to visit the Land of the Rising Sun in March 2014. It has been eight years since the last visit and lots have changed. 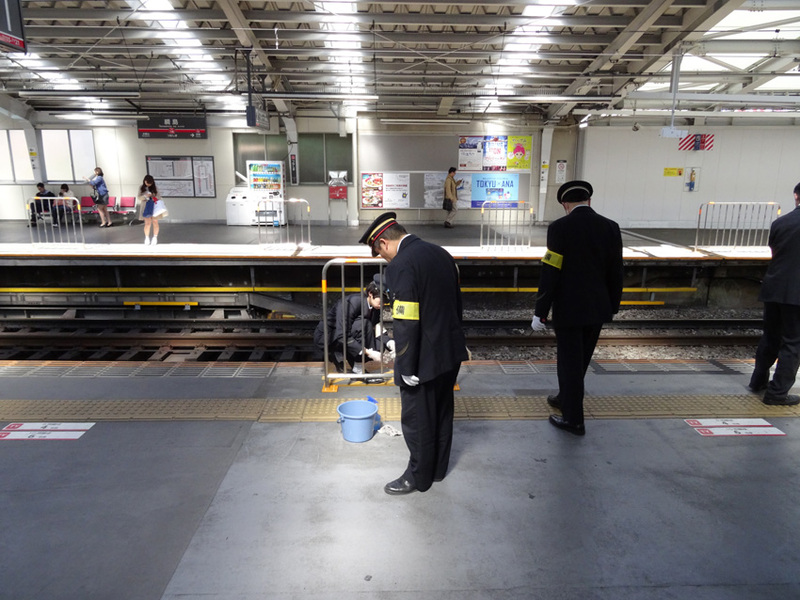 The Site Admin chose to loiter around Tokyo and its suburbs during his visit, here are some of the photos. Its a rainy day after landing there. Here is a Hino Dutro (JDM) ‘stabled’ at Tokyo Station Platforms 5 and 6 (山手線/Yamanote and 京浜東北線/Keihin-Tohoku Lines). 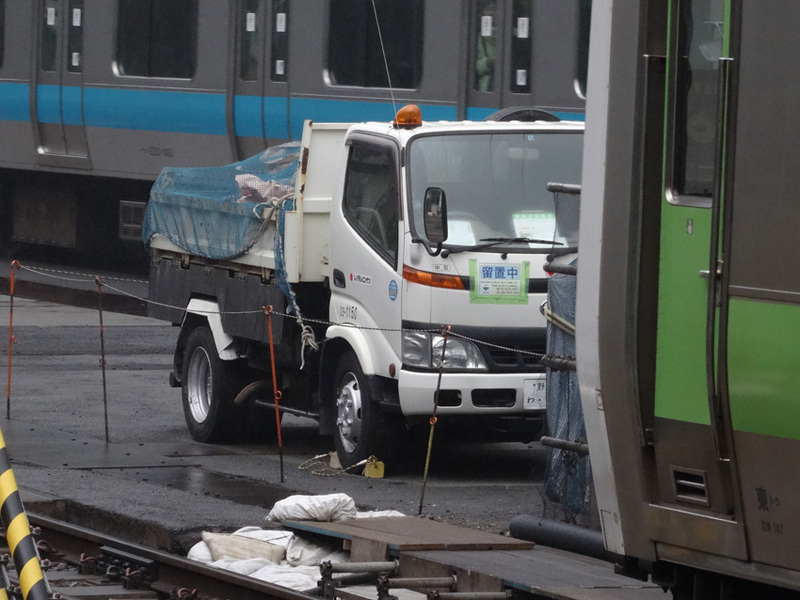 Works are always going alongside heavy traffic rail lines in Japan; one would not be surprised to find many works staging area along the line in an organized fashion. 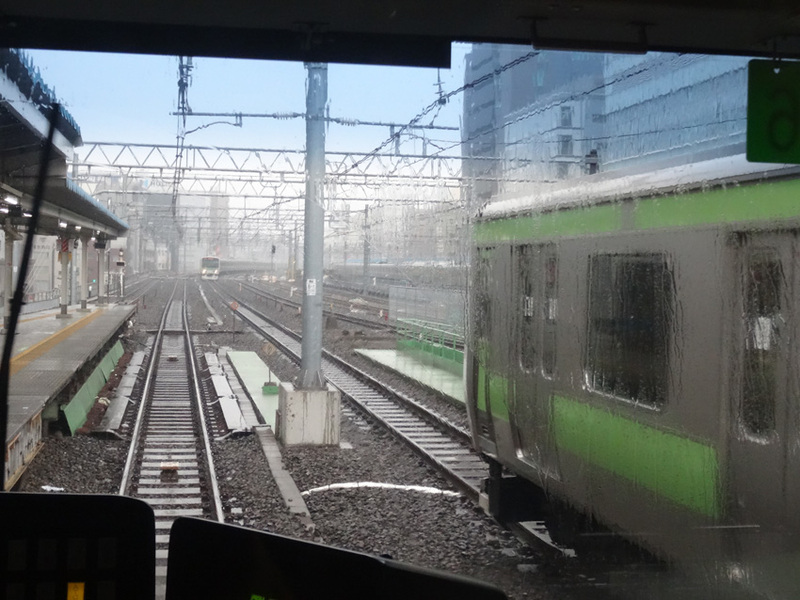 The rainy morning drags on as the Site Admin heads north on Yamanote Line’s service 814G, 8 meaning the hour it departed 大崎駅/Osaki Station, the station where Yamanote Line technically terminates and departs. 14 is an even number (duh! 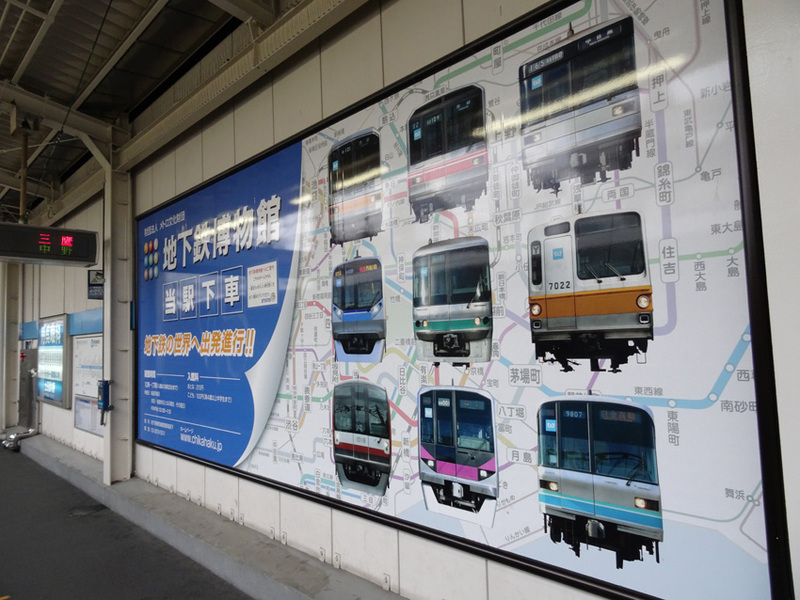 ), meaning that the train service is in the inner track, traveling in an anti-clockwise fashion (Japan drives on the left, so does their trains). A congestion has developed at 秋葉原駅/Akihabara Station, as the outer track trains catch up with each other. Despite manually-controlled trains, the Site Admin has come to respect train engineers (as in train drivers/operators in European terms) in their daily job of controlling hundreds of tons of metal and entering 10-car long station platforms at 70-80 km/h, no matter if its dry or wet weather, adhering to tight schedules atypical in a metropolis like Tokyo. The Metro culture is strong in Japan. South from 福岡/Fukuoka to 札幌/Sapporo in the north, several cities have their own underground heavy rail. 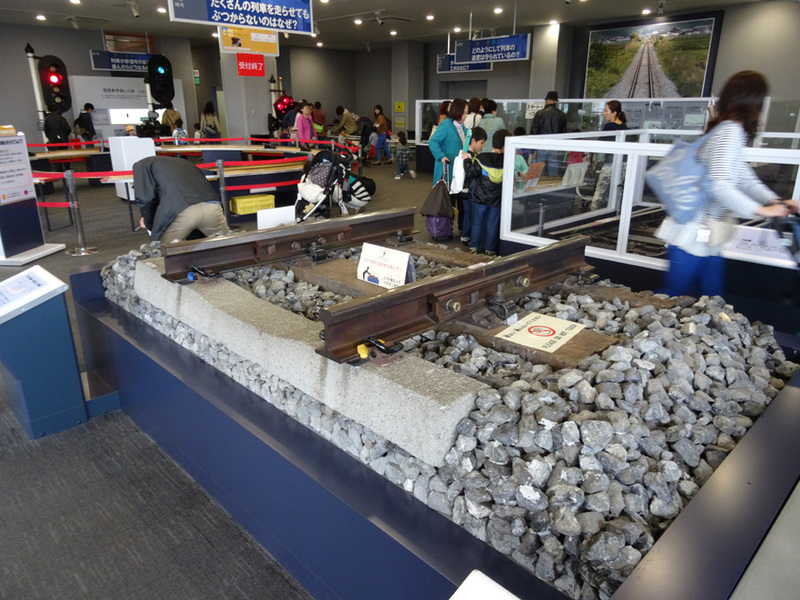 Out of numerous railway museums in Japan, the Site Admin has yet to visit Tokyo Metro’s establishment, and so he did on this trip. 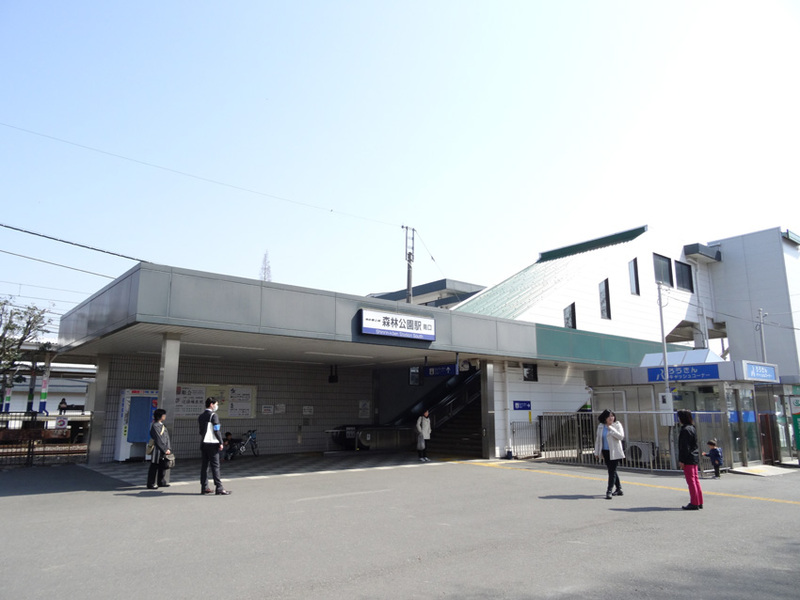 It is located at 葛西駅/Kasai Station along the 東京メトロ東西線/Tokyo Metro Tozai Line. 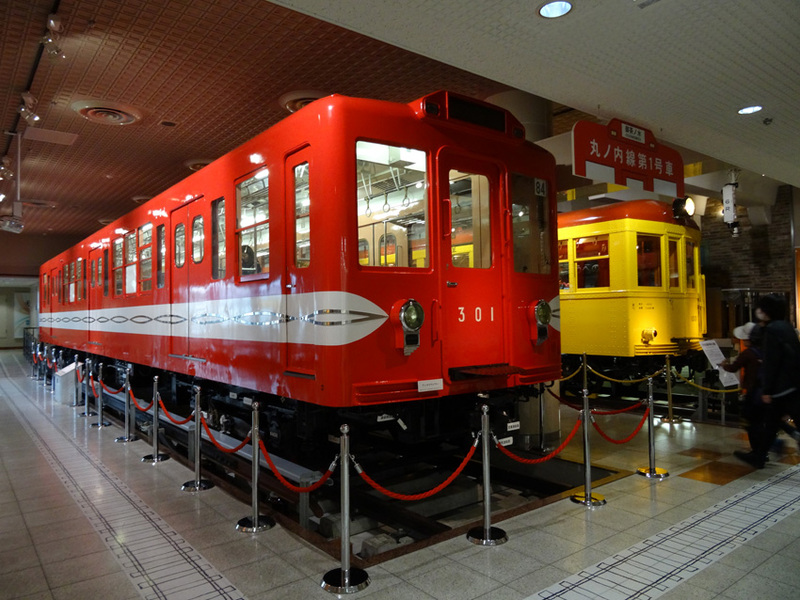 Here, preserved in pristine condition are the 丸ノ内線/Marunouchi Line Series 300 and 銀座線/Ginza Line Series 1000. 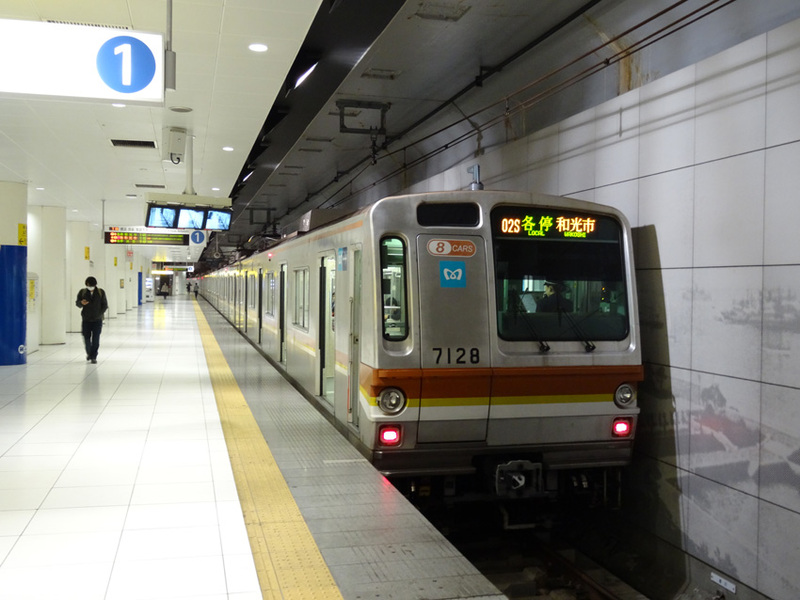 The latter is the first underground rolling stock in Japan when the line opened in 1927, also as the first subway in East Asia. The top-contact third rail collector shoe design. Fitted with springs, the collector shoe is designed to have constant contact over the third rail running beneath it. Third rail systems are largely divided into top or bottom contact, and each have their pros and cons. 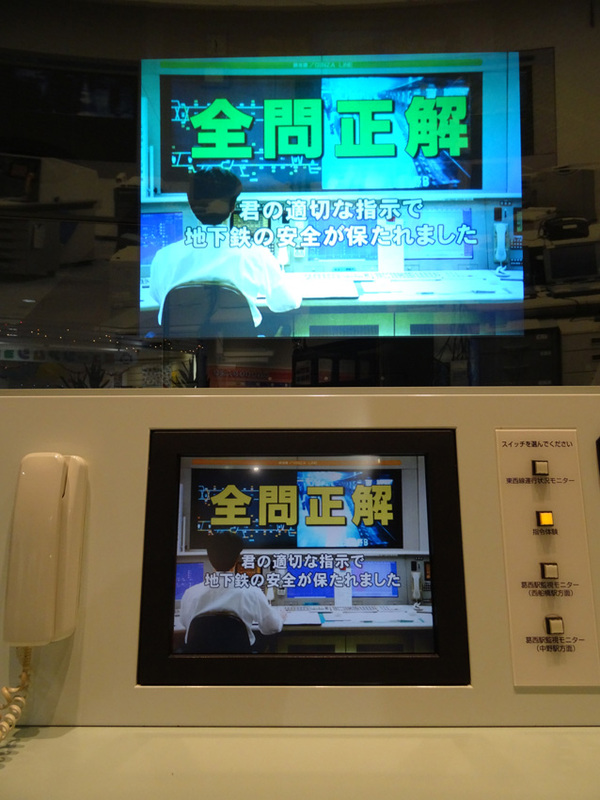 Most systems in Japan uses the top-contact system. There is a quiz area, obviously its designed for kids. They include questions such as choosing the appropriate response to a flooding situation in a station, what should be done during a fire alarm, how to do train separation during an imminent service disruption. Naturally, rules apply universally, plus a little common sense, one could get an all-correct. 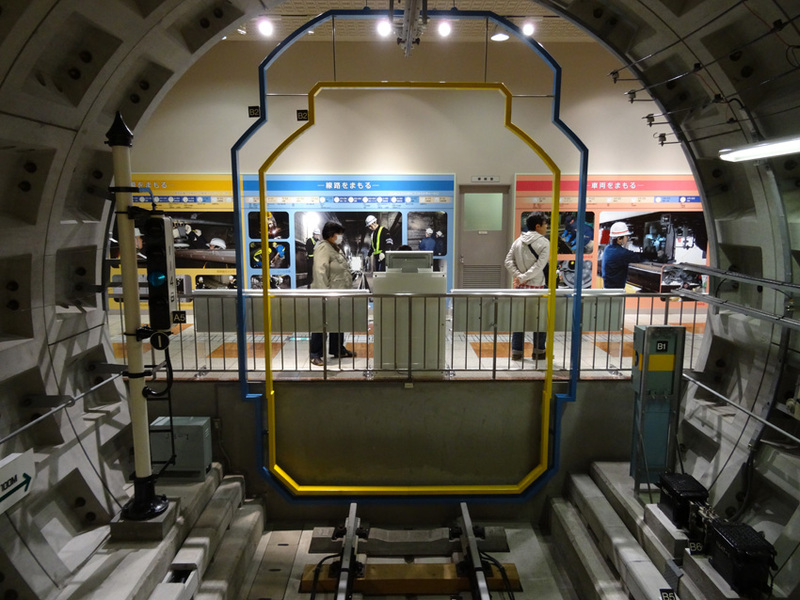 Next to the quiz area is a 1:1 scale cutaway of Tokyo Metro’s latest line, Number 10 Fukutoshin Line. It features real concrete slabs for lining tunnel walls, track-side equipment and outlines of the train static and kinematic envelopes. Detailed explanation is also given for every equipment in both Japanese and English. 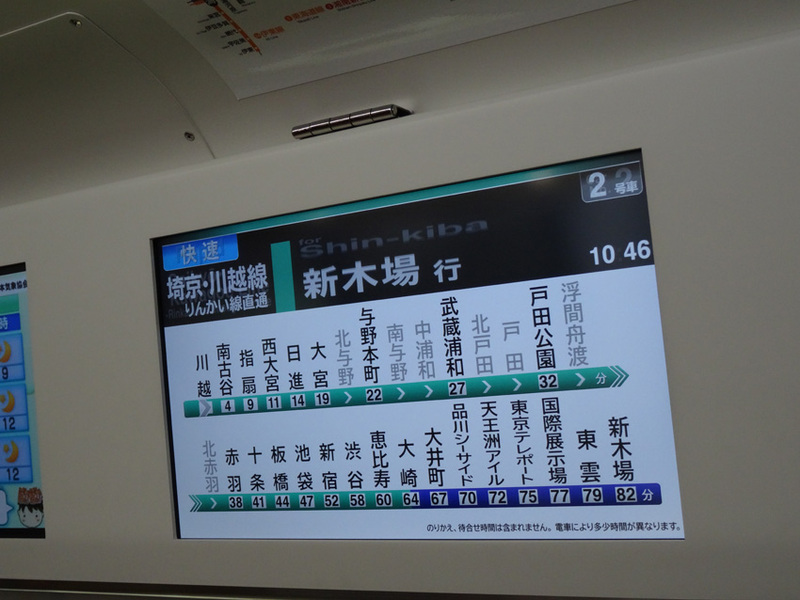 The next day, the Site Admin went south towards 横浜/Yokohama to catch one of the longest train service near Tokyo. 05T operated by a 東武鉄道/Tobu Railways train, running from 元町・中華街/Motomachi-Chukagai on the みなとみらい線/Minatomirai Line, thru the 東急東横線/Tokyu Toyoko Line, 東京メトロ副都心線/Tokyo Metro Fukutoshin Line and 東武東上線/Tobu Tojo Line, terminating at 森林公園/Shinrin-Koen station, a journey of 88.7 kilometers. 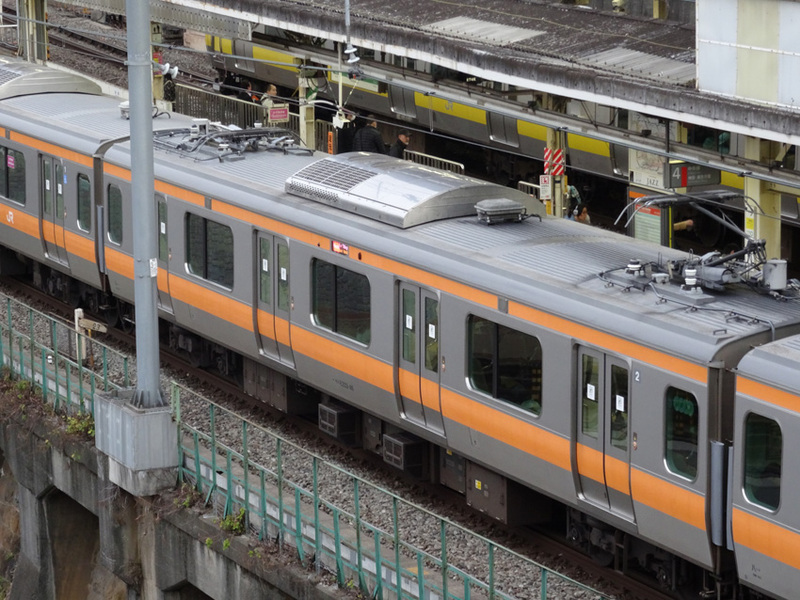 Here is a Tokyo Metro Fukutoshin Line Series 7000. 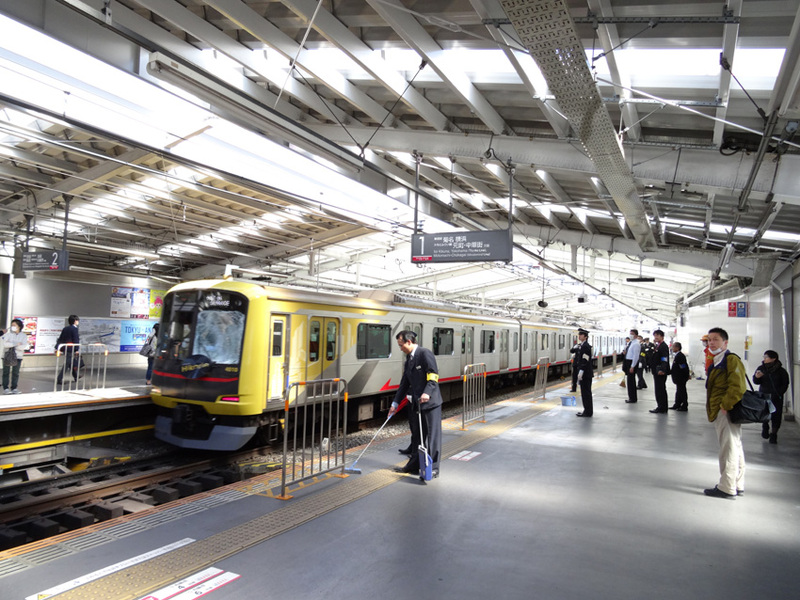 Originally running exclusively on the 有楽町線/Yurakucho Line (Line 7), it was roped in to co-operate on the Fukutoshin Line. It too has sisters in Indonesia, where units retired earlier were sent to operate on KRL Commuter Jabodetabek. 05T was operated by Tobu Railway’s Series 9000, 9106F that day. 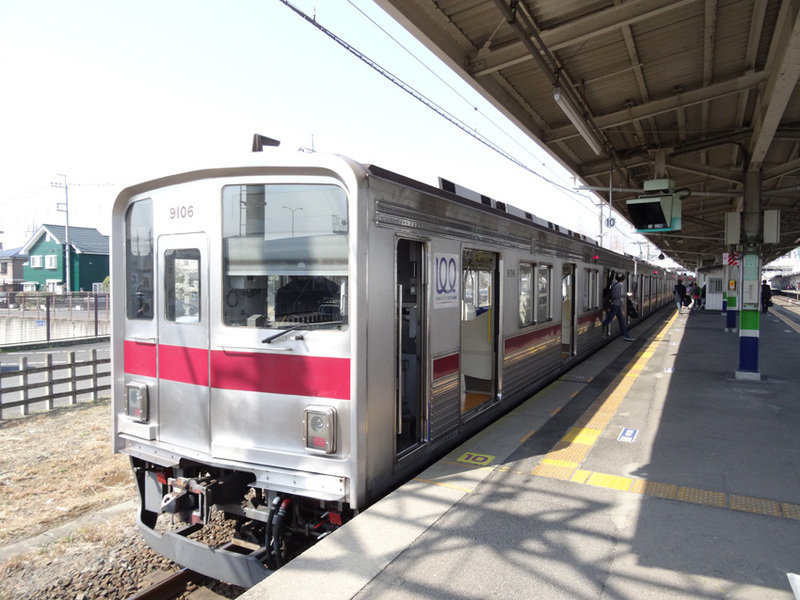 Equipped with Electric Chopper propulsion of an early variant (AFE, Automatic Field Excitation), the train works well with Fukutoshin Line’s Automatic Train Operation (ATO), as well as signalling systems of three other lines it operate on. Turning 27 years old coming 31st July, its series of trains are machines to look out for when traveling on the tracks that lead to Fukutoshin Line. The temperature is a cooling 10 degrees this morning. Picked up by the wind, the square in front of the station gets really chilly! Kids have fun with rental bikes while their parents chit-chat in small groups. Shinrin-Koen is in 埼玉県/Saitama Prefecture, just north of Tokyo. After a short ride on the Tobu Tojo Line, here is JR Series E233-7000 serving a largely single-tracked JR川越線/Kawagoe Line to 大宮/Omiya station, where it will carry on service to 新木場/Shin Kiba via JR埼京線/Saikyo and りんかい線/Rinkai (the latter, a private rail) Lines. LCD screens show commuters the estimated times to the stations along the way. 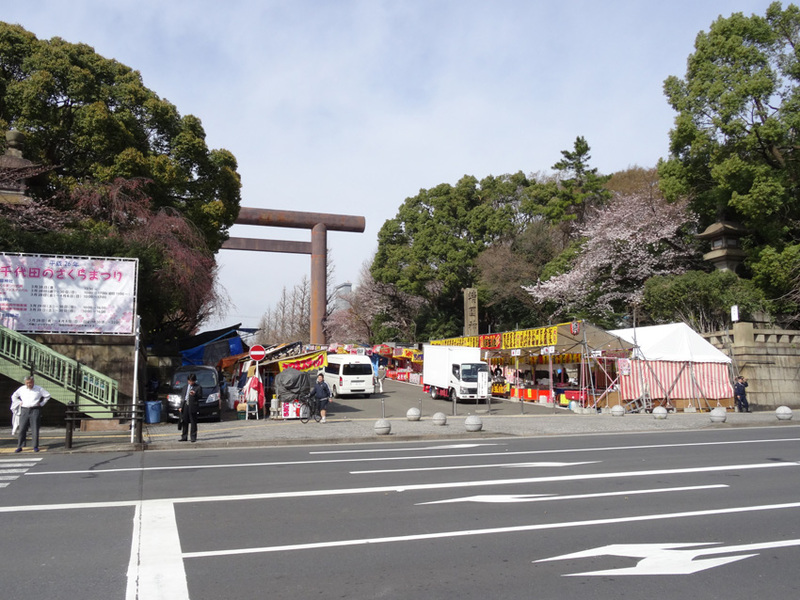 The Site Admin grew interest in visiting the 靖国神社/Yasukuni Shrine before the visit. 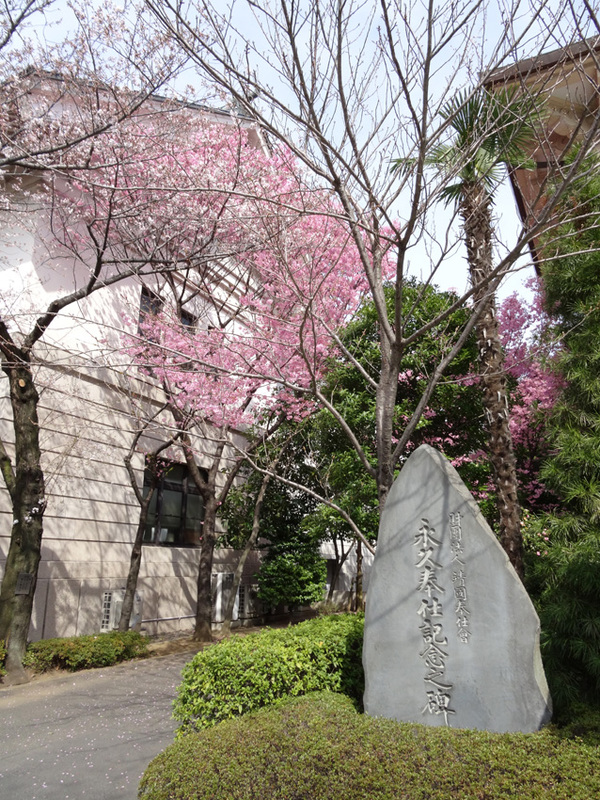 Along the avenue named after the shrine in 千代田区/Chiyoda Ward, one can find a huge 鳥居/Torii. 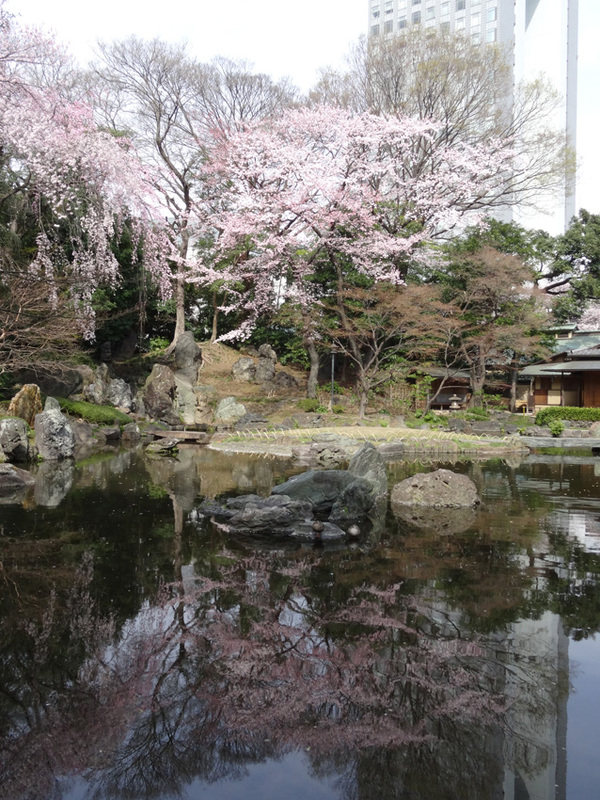 Imperialist ideals aside, the shrine is one place to admire sakura flowers blooming. 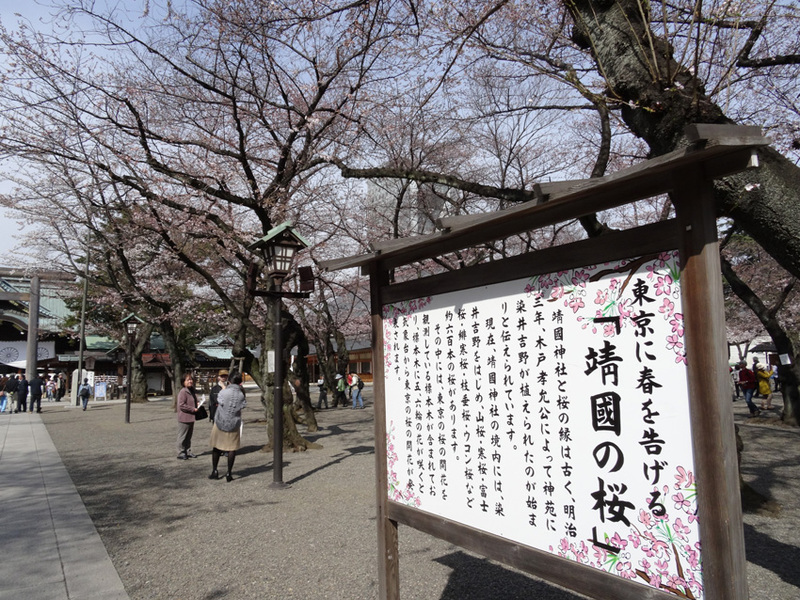 A short description of how Sakura flowers in Yasukuni announce the arrival of Spring to Tokyo. One can see the shrine’s main hall towards the left. A memorial by the shrine’s missionaries next to the side halls and offices, where more flowers can be seen at the background. The back garden has landscapes with more flowers for one to admire. 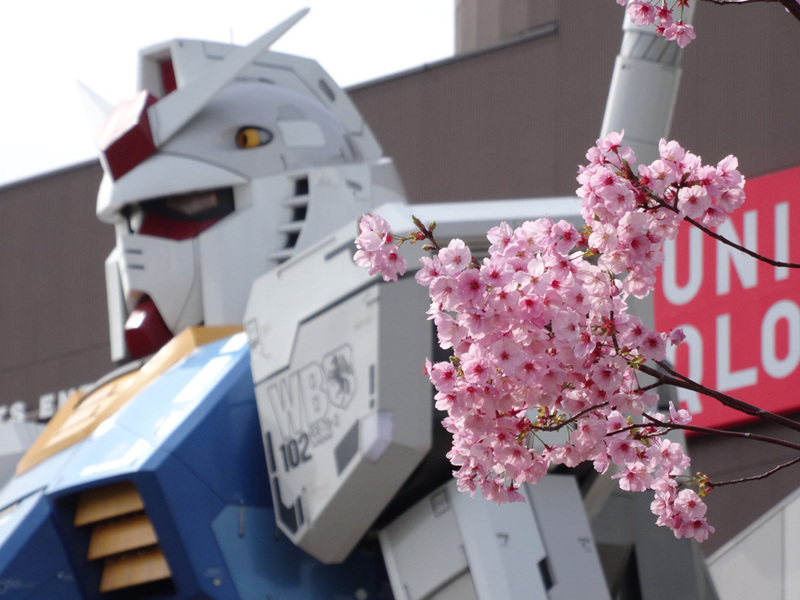 It is the time of the season, just outside of Diver City Odaiba at お台場/Odaiba, one too can find the 1:1 RX-78 Gundam mobile suit with some flowering species nearby. 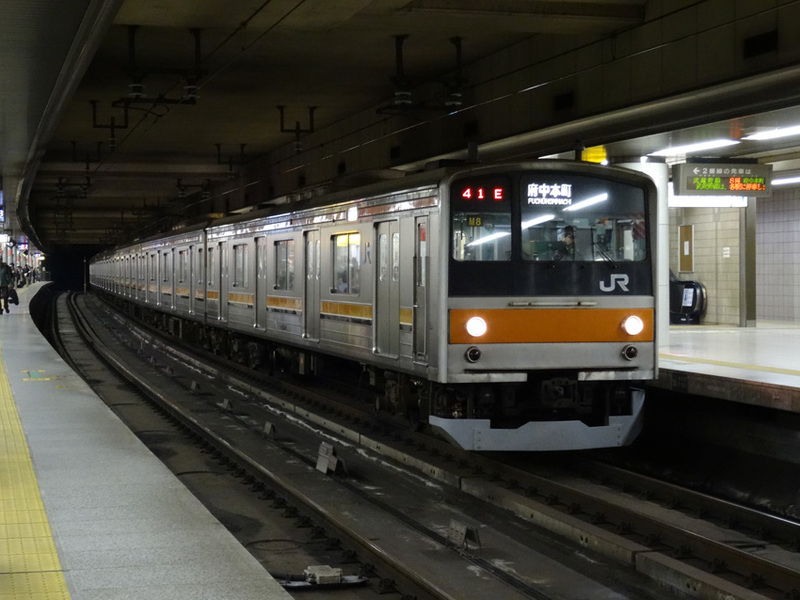 The venerable JNR Series 205, still serving on the 武蔵野線/Musashino Line with upgraded propulsion equipment, will see its replacement in coming years. Will it be retired E231, or another sub-variant of the popular E233? We shall see. 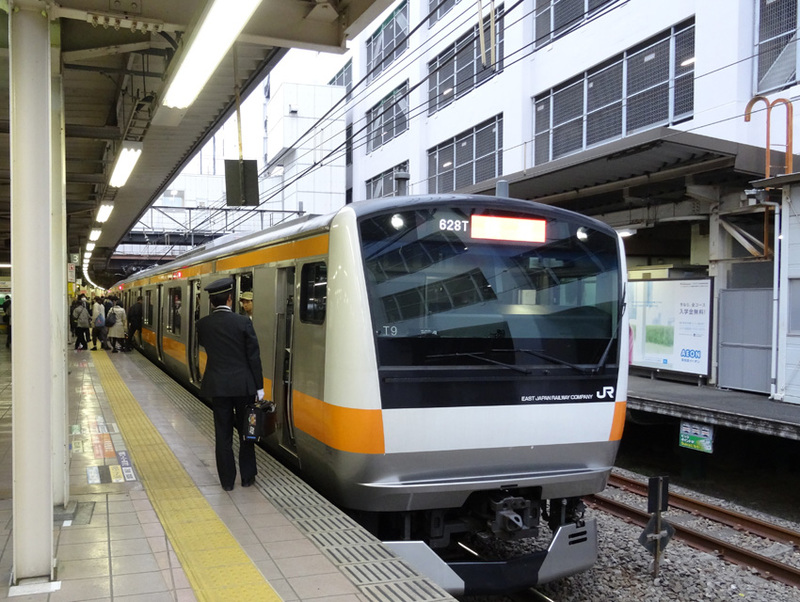 High-capacity and disabled-friendly features are much needed in Japan. Championing lift-equipped buses decades ago, the Japanese have ventured into full low-floor buses but found the costs too high. Settling down with low-entry variants, local governments have grown interest in perhaps the most successful example of full low-floor buses; the Mercedes-Benz Citaro (G for its articulated variant). 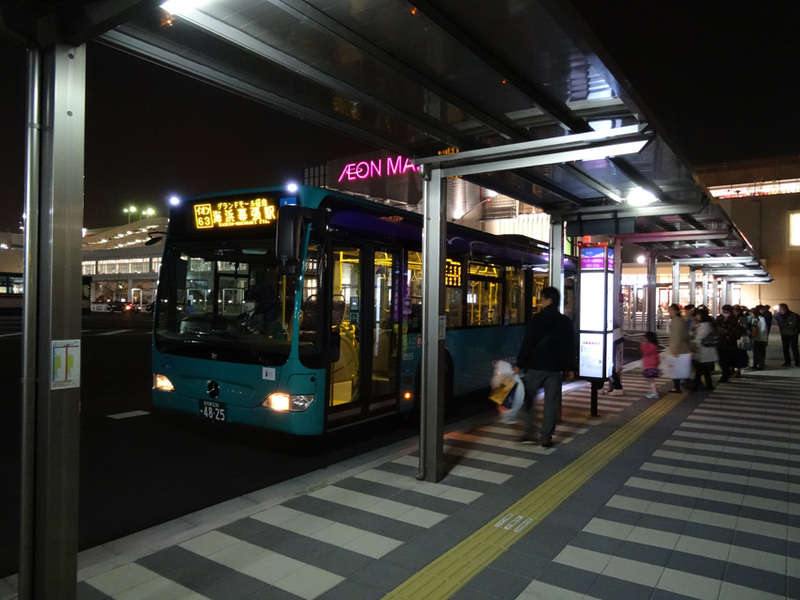 京成バス/Keisei Bus bought units to replace their aged Volvo B-10MA, but several Citaro G have seen trials all over Japan. Now, at least three other operators have Citaro G buses and more will join the league. The first commuting day of the week, as usual of Tokyo, it is plagued with 人身事故/passenger accidents. As the Site Admin heads south towards 横浜/Yokohama, an accident on the 東急東横線/Tokyu Toyoko Line grinds it to a halt. After alighting at 綱島駅/Tsunashima station, the accident train, turned around at 菊名駅/Kikuna station, heads back to 元住吉/Moto-sumiyoshi Depot for repairs. The accident ‘victim’ was an early-20s who survived with serious injuries. The accident train was none other than Tokyu’s ヒカリエ号/Hikarie-go (4110F), specially colored and designed to mimic their 渋谷ヒカリエ/Hikarie establishment at 渋谷/Shibuya. Fellow railroad workers in Japan have it tougher, as such passenger accidents happens almost everyday on any other line of any random company, the job to maintain operations does not confine to crewing of trains or maintenance, but also clean-up, often unsightly scenes, after someone has hurt themselves on the premises. With this, the Site Admin give them a hats-off. Another JNR Series 205, this one serving the JR横浜線/Yokohama Line. Formation H6 was shipped to Indonesia in May 2014, shortly after the visit. Behind, an E257 express EMU heads towards Tokyo on yet another long run from 甲府/Koufu. 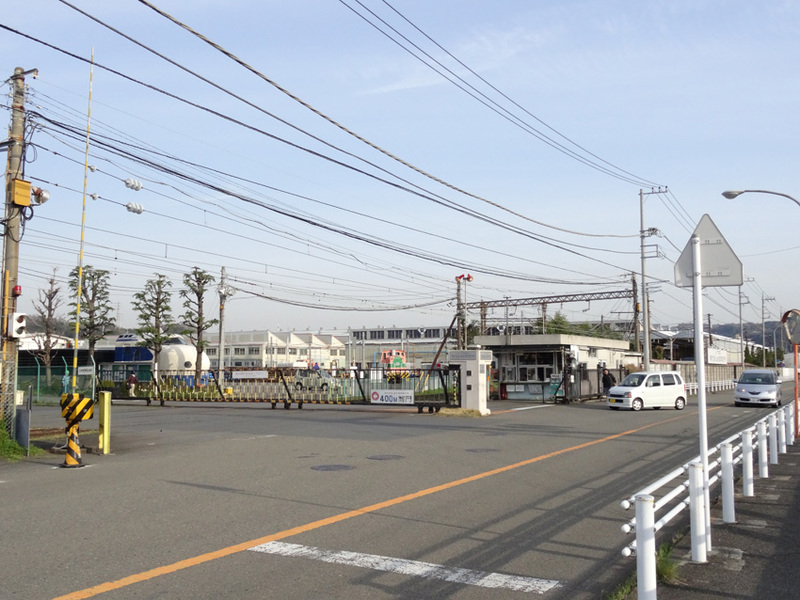 The main gates of 総合車両製作所/J-TREC, ex-東急車輛/Tokyu Car Corporation. Some passenger trains and equipment for use in Singapore, United States (particularly New York) and South Africa were manufactured here, do you know some of them? 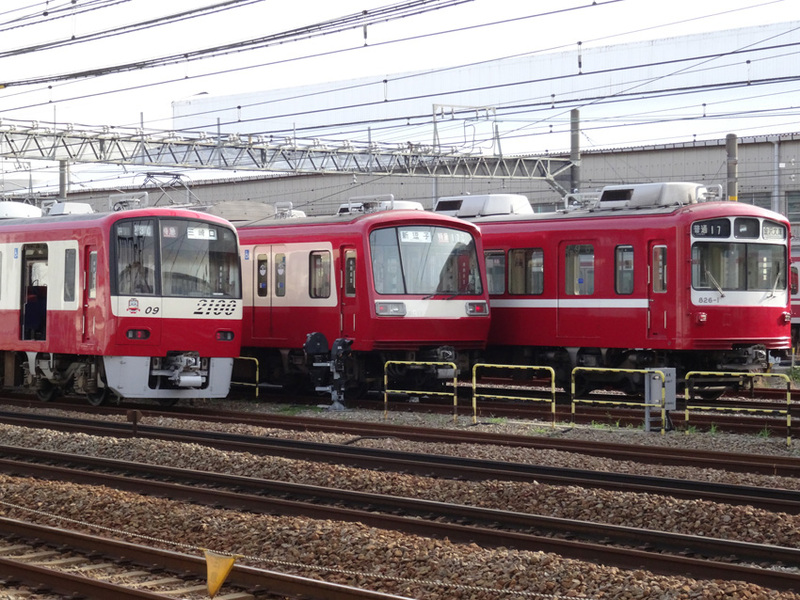 The three generation of EMU design at one go, all operated by 京浜急行電鉄/Keikyu. L to R, the Type 2100 of the late 90s with 3-Dimensional front GRP mask, aluminum construction. Type 2000, with a ‘く’ shaped streamlined front, a common design of the 80s. The Type 800, last of the 70s design still running, with a wrapped front, often dubbed the だるま/Daruma. One thing has not changed over the three generations, are the use of Bolster Bogies by the company, for a combination of speed, comfort and performance. Indeed, one can only fully understand this once they have taken one of the Red Trains. 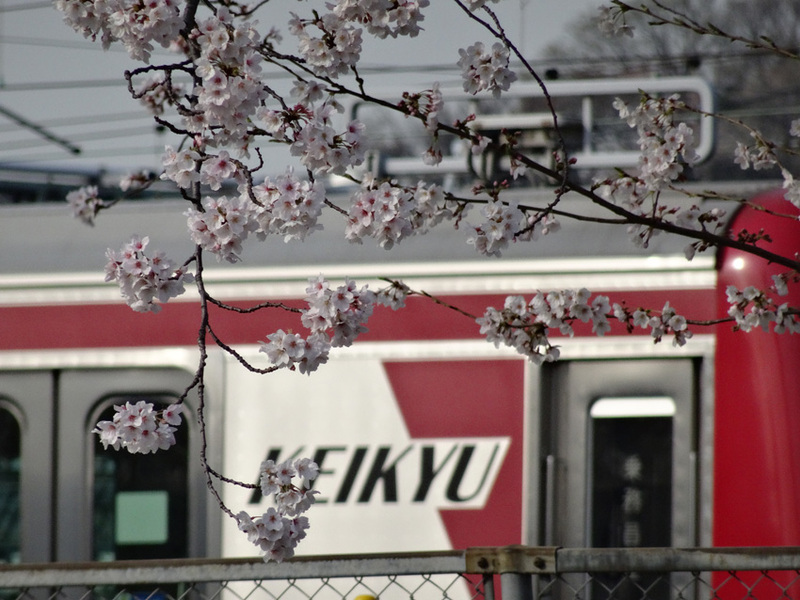 Even flowering trees planted inside the depot at 金沢文庫/Kanazawa-Bunko announce the arrival of Spring. 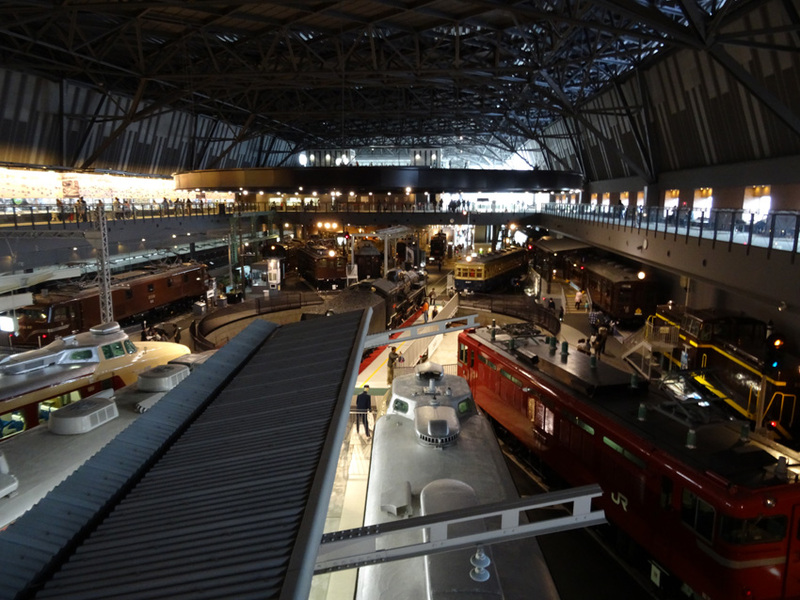 As a railway worker in its own right, the Site Admin finds the Japanese railway scene similar to the society. Fast paced, being stringent when it comes to safety, and yes, punctuality, are some of the values embraced by their workers. Often or not, humans err, and sometimes actions governing safety are briefly floated through, and this too is very common. The Site Admin too met unruly enthusiasts, like a trio who made a ruckus at Tsunashima station when the accident train was withdrawn past. They stood at very the edge of the platform while filming, cursing the victim and the railway company. They have more passion about the train itself than compassion for the victim and staff who had to clean up! When staff rushed forward to stop them, the ‘fans’ directed their ‘anger’ at them. It was truly an unsightly scene adding on to the already negative one. Going more technical, Japan has not changed much to the Site Admin, other than new trains running on lines he has already taken before. New designs, technologies implemented on trains are no doubt a welcoming sight. Perhaps due to several separate unit powering (MM’ type, two motor cars dependent on each other as a single propulsion ‘unit’, several of which makes up an EMU with trailer cars), new JR East E233 trains such as the -2000 on Keihin-Tohoku Line still exhibit jerking during acceleration in dry conditions, something that manifested since the E231 stocks, observation with reference to VVVF propelled stocks only. When asked, veteran railway engineers serving as volunteers at the Railway Museum could not give a definite answer; perhaps the combination of a long formation, automatic couplers between all cars, and the MM’ method makes this jerking a very ‘Japanese Commuter EMU’ thing. Redundancy at its best; a physical redundancy! The Site Admin was looking forward to spotting the highlight component of the E233, dubbed the newest in redundancy concept, and here is literally a redundant, standby pantograph that is kept during normal operations. 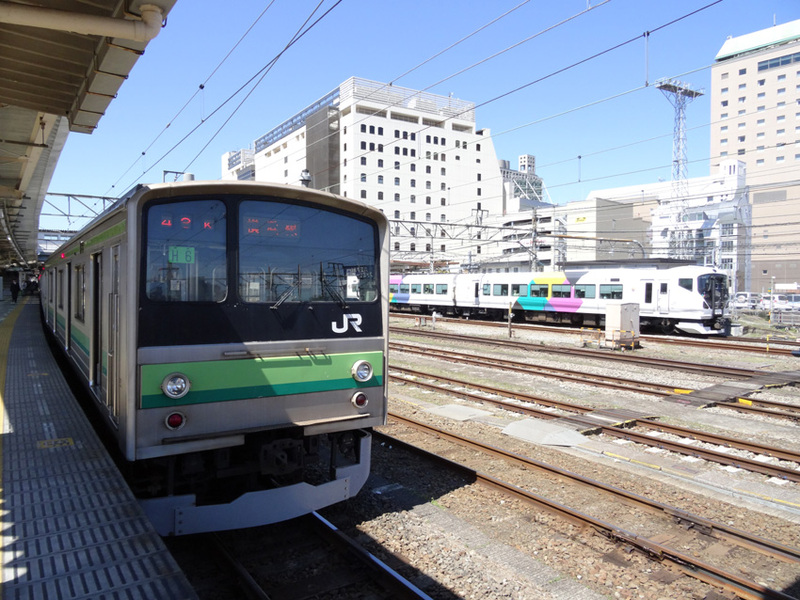 Failure of the E231 to respond to many issues have led JR East to design the E233 with not only software redundancies, but also to back the ever-breaking pantographs up. For this the Site Admin gives the well-deserved kudos! Even the windscreen wipers on the E233 have redundancy, can you spot it? Yes (and most probably no), the two wipers in tandem are for normal use, while the single one on the right is stowed vertically for back-up. The use of High Intensity Diode is obvious too, extending the viewable distance beyond conventional headlights of the E231. Education starts young. When as young as the kids in the background, the Site Admin could not visualize a permanent way structure such as the one shown here; a cutaway of ballasted tracks. 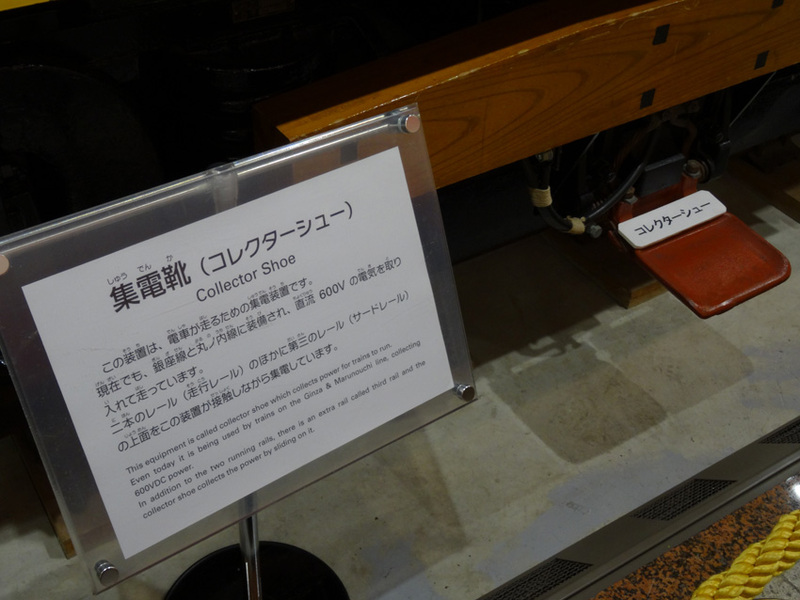 For kids in Japan who visited the Railway Museum and came across this section, it would be fast for them to understand, as well as many other jargon it takes years to learn. Education must, and always, start young. No matter if its a positive or negative subject, hobby or industry, a pair of rails lead people to where they never thought would, moved masses once imagined, introduced new worlds to mankind, only limited to where rails can be laid! No matter if you are a student, enthusiast or worker related or not to this industry, Japan is one place to visit when it comes to iron horses on iron rails. With this the Site Admin will take yet another hiatus, and hope to write again soon!